With Charitable Donor Comments active, your donors can leave comments when they make a donation. Installing Charitable Donor Comments is the same as installing any other Charitable extension. If you’re not sure how to do that, we recommend first reading our guide to installing Charitable extensions. 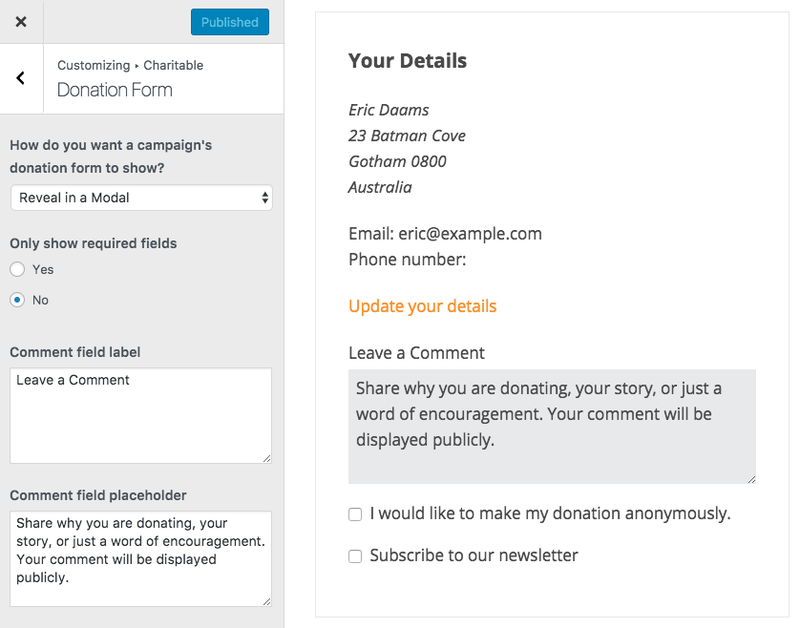 You can change the label and the placeholder value of the comment field in the donation form in the WordPress Customizer. Customizing the donor comment field in the WordPress Customizer. Go to Appearance > Customize to open the Customizer, and then navigate to Charitable > Donation Form. The preview window will automatically refresh when you change the label or placeholder. When you are happy with the settings, click on Publish to make sure the settings are saved. Charitable Donor Comments includes the ability to display donor comments in the regular comments area on a campaign page. You can enable this option by in the Donor Comments settings area at Charitable > Settings > Extensions. Just include this in your email content where you would like to show the comment. If no comment was left, the shortcode will not show anything. Comments are added as regular WordPress comments, so you can manage them via the Comments page in your WordPress dashboard. You can approve or reject comments, edit them or reply to them directly from the WordPress dashboard. Note: Since donor comments are added as regular comments, they will automatically go through the same Akismet SPAM filtering that regular comments do, if you have Akismet installed. On top of that, when you are viewing donation details you can see the comment left by the donor. For non-approved comments, you can approve them directly from the Donation details page. There is also a link to edit the comment.